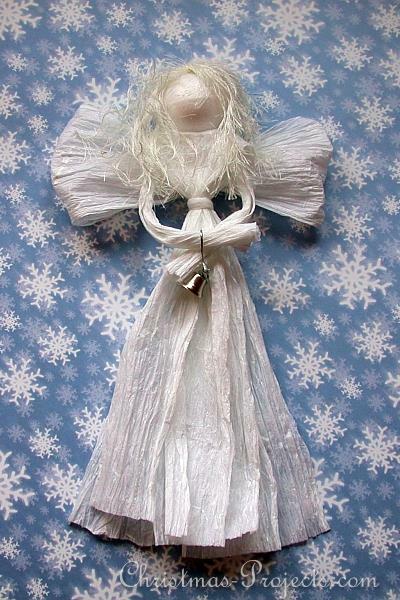 This heavenly angel is beautiful in white and can be used to adorn your Christmas tree or even an elegant Christmas gift in silver or white. 1. Cut 3 x 60 cm pieces of paper twist out. Lie all 3 pieces on top of each other and fold in the middle. Make a very small hole in the center of the fold. Insert a 30 cm piece of thick wire through the hole. At the top of the wire, insert a styrofoam ball. Glue wire into styrofoam if necessary. 2.You can now add a couple of drops of glue to the top of the dress where the head touches to secure the dress to the head. 3.Cut a 25-30 cm piece of wire and wrap with with paper twist. This will be the arms. Place this now under the dress up to where the head is located. 4. Fold the dress back down over the arms again. 5. 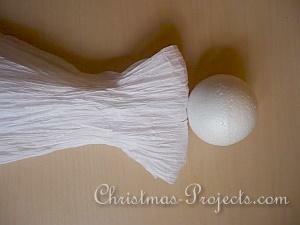 Now you will wrap a paper twist belt around the angel to hold the dress together. 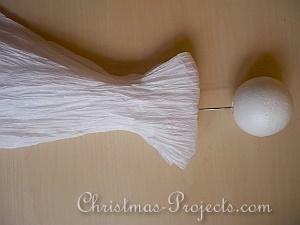 Glue the ends nicely to the backside of the dress. 6. 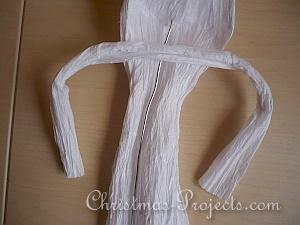 Make wings with paper twist by folding a piece about 20 centimeters long in half and gluing the ends together. Place the piece flat on the table and bring the seam to the middle. Then pinch it together at the middle. Glue the wings then to the backside of the angel so that the seam is facing the body (and therefore cannot be seen). 7. Cut about thirty 20 cm lengths of fringe yarn. Place these together and tie the middle. This middle will now be glued to the top center of the angel as hair. 8. 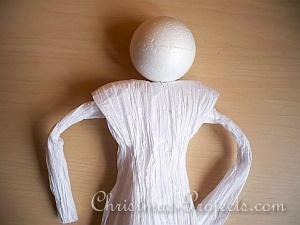 Fold the arms together and add a bell as decoration.